China expectedly topped the medals standings in the 18th Asian Athletics Championships, but Japan was not far behind, winning four of the nine finals on the concluding day at the Guangdong Olympic Stadium on Saturday. China’s eventual haul of 18 gold, 19 silver and 10 bronze medals for a total of 47 medals might not have reached the expected target, but Chief Coach Feng Shuyong expressed his satisfaction. Despite setbacks in the sprints, Japan ended up with 12 gold, five silver and five bronze medals. As though to make up for the losses in individual sprints, Japan put in that much extra to win the sprint relays in both sections and also took the men’s 4x400m relay gold. Quite expectedly, javelin thrower Yukifumi Murakami, bronze winner in the World Championships in Berlin, claimed the gold with a fourth-round throw of 81.50m. The presence of Murakami and the challenge thrown by him drew the best out of 21-year-old Chinese Wang Qingbo. He came up with a last-round throw of 80.25m, a personal best. The more experienced Qin Qiang took the bronze in 80.08m. “I was not in good form today, but since it was the Asian Championships I wanted to win,” said Murakami. 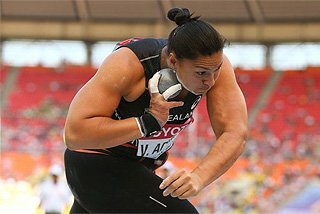 “To throw over 80 metres is good level. This is the first time for me to achieve this distance in an official competition. I had no championship experience before the National Games (in Jinan), so I was a little nervous. But I was relaxed this time, “said Wang Qingbo. 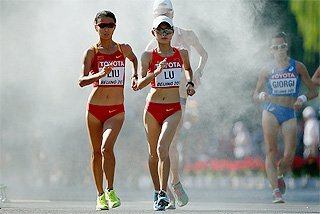 World Championships marathon champion Bai Xue won the women’s 10,000 metres in a slow 34:11.14. In a waiting game that never seemed to end, Bai Xue took off with only about 650 metres left to the finish to easily win the title. The fight for the second place also never materialised since Japanese Mari Ozaki and Chinese Wang Jiali played into the hands of Indian Kavita Raut. 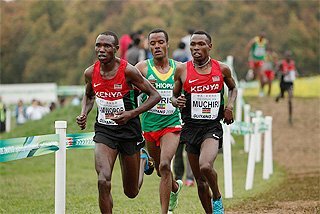 The Japanese and the Bahrainis, Tejitu Daba Chalchissa and Gladys Cherotich Kibiwot had taken turns to slow down the pace and that seemed to suit the Chinese perfectly. 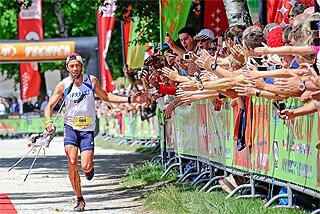 Without perhaps anyone realising, the pace suited Raut also. And she had the kick to leave the rest well behind when Bai Xue took off on the penultimate back-straight. 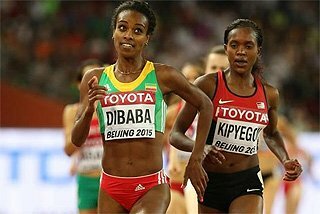 Chalchissa, who was practically robbed of the 5000m gold by Chinese Xue Fei, ended up fourth, while Kibiwot collapsed with around 1500 metres to go and had to be stretchered out. The men also played the waiting game, but not for too long. 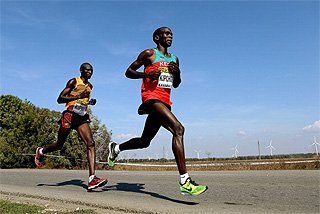 In a field in which the two Qataris, Nicholas Kemboi and Ahmad Abdullah Hassan, and the defending champion from Bahrain, Hasan Mahboob, were the favourites, the others had very little role to play. The trio did have Yusei Nakao for company for much of the distance, but it was a futile effort by the Japanese. With three laps to go, Kemboi broke first, leaving the Japanese behind, but still having his team-mate and Mahboob in hot pursuit. Mahboob made his move only on the final back-straight. He simply strode past Kemboi and though the latter tried till about 60 metres from the finish before giving up, Mahboob, formerly Silas Kirui of Kenya, was never threatened. Mahboob clocked 28:23.70m Kemboi 28:25.22 and Hassan 28:28.38. “The cold weather made it a tougher event than it usually is,” said Mahboob. Iranian Ehsan Hadadi retained the men’s Discus Throw crown. Back from an injury, it was Hadadi’s first major competition this year. There never was any evidence of rustiness as the Iranian, the Asian record holder at 69.32, threw to a distance of 64.83m on his third attempt. He fouled his next three. Mohammad Samimi, World University Games champion this year, crossed 64 metres on his last attempt for the silver. Wu Tao, the experienced Chinese was third in 59.27m. Chinese Zhang Xingjuan took the women’s high jump gold with a clearance of 1.93m. The surprise was the elimination of defending champion Tatyana Efimenko of Kyrgyzstan at 1.87m, at fourth place on a countback with Svetlana Radzivil of Uzbekistan who took the bronze. Nadezhda Dusanova, who has jumped 1.95m this season passed once at 1.93m and failed twice at 1.95m to take the silver behind Zheng. “An average performance was okay,” said Zheng who had won the National Games title in Jinan last month with a PB of 1.95m. The relays brought plenty of excitement for a few thousand spectators with China figuring prominently in three of them. 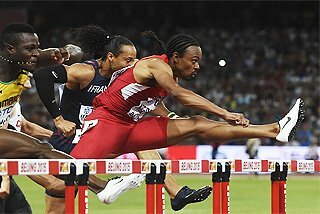 The Japanese men’s sprint team scored its second victory over China, having beaten it in the heats also, clocking 39.01. China timed 39.07. “Japan was the bronze medallist in the Olympics and ranked among the top three in relay. Their standard is very good. It is rare for us to bridge the gap between us and the Japanese team. We need to learn from Japan on their baton-exchanging skill. 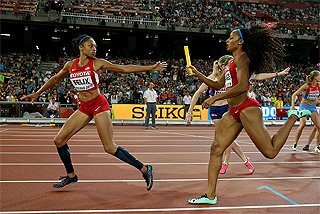 I have never seen them drop the baton. Their skill is definitely better than those of the USA and Jamaica. 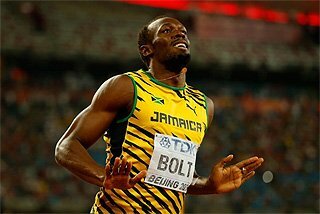 The Japanese are only inferior in their individual capability,” said Chinese anchor and 100m champion Zhang Peimeng. With China disqualified in the women’s 4x100m heats, Japan had it easy, with only Thailand putting up a token fight. Japan also won the men’s 4x400m relay with China nudging India out of the silver bracket on the home straight while in the women’s 4x400m event, China scored its first victory since the 2003 edition beating perennial winner India. Twenty-one of the 38 countries that participated in the five-day Championships won medals. The next Asian Championships would be held in Kobe, Japan, in July 2011. 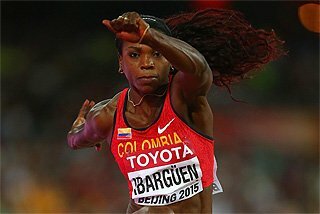 The AAA Secretary, Maurice Nicholas, said that it had been decided to hold the championships from now onwards between May and July keeping in mind the scheduling of the IAAF World Championships. Mr. Nicholas agreed that the championships being held in different months, with this one coming late in the season had created problems for the athletes. Discus: 1. Ehsan Hadadi (Iri) 64.83, 2. Mohammad Samimi (Ir) 64.01, 3. Wu Tao (Chn) 59.27. Javelin: 1. Yukifumi Murakami (Jpn) 81.50m, 2. Wang Qingbo (Chn) 80.25, 3. Qin Qiang (Chn) 80.08. 4x100m relay: 1. Japan 39.01s, 2. China 39.07, 3. Chinese Taipei 39.57. 4x400m relay: 1. Japan 3:04.13, 2.China 3:06.60, 3. India 3:06.83. Women: 10,000m: 1.Bai Xue (Chn) 34:11.14, 2. Kavita Raut (Ind) 34:17.21, 3. Wang Jiali (Chn) 34:22.64. 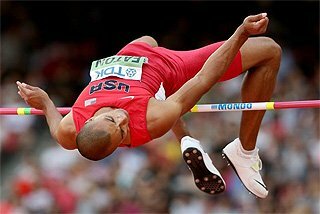 High jump: 1. Zheng Xingjuan (Chn) 1.93m, 2. 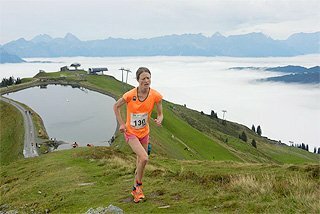 Nadezhda Dusanova (Uzb) 1.90, 3. Svetlana Radzivil (Uzb) 1.87. 4x 100m relay: 1. Japan 43.93s, 2. Thailand 44.55, 3 Korea 45.46. 4x400m relay: 1. China 3:31.08, 2. India 3:31.62, 3. Japan 3:31.95.